I`ve traveled a lot and whenever I came to a new city there were very few options to discoverthe city – either hire a tour guide for or join a bigger group or do it in your own. This project is for “on their own travelers” who find guide books really boring and but still want to get to know the city and its history and look for a better alternative. 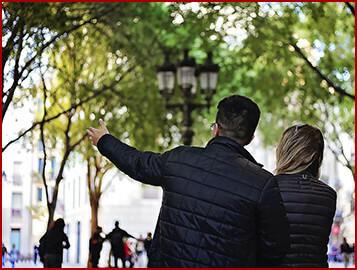 UnPuzzle Barcelona combines everything a traveler would look for – it is easy to buy, available to start at any time – no reservations, mails or phone calls needed, ideal to manage the time, explore the city without getting lost and learn history without getting bored! And a bit of adventure to make the city investigation more exciting! For locals and travelers - Discover city sights, stories, puzzles, and curiosities in a new way, explore the best of the city and have fun! A unique experience in Barcelona! More than tourism - Put the game mode on! 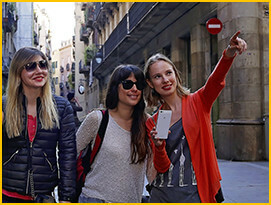 Get the riddles on your smartphone and find the answers on the streets of Barcelona. You'll remember better things that you discover on your own! We offer special game mode for company big group events and team buildings. Compete with your friends or colleagues, get points, see who finishes first and explore the city! Language schools students - A perfect opportunity for language school and exchange students to practise the language and discover Barcelona! Birthday parties - A fun and unusual event for your special day in Barcelona! Bachelorette parties - A fun and unusual event for your special day in Barcelona! Visit to bars included! 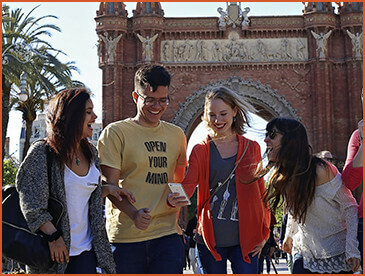 Students - for any age - educational treasure hunts to explore Barcelona in a fun way! Eugenia Anikina - our freelance designer, the creator of our style and logo! Eduardo Alejandro Bastidas and Júlia Mateu Comellas - for their great contribution in the translation of our websites. Oscar Hernan Reina Torres - the author of the best promotional photos for our project. UnPuzzle Bcn is registered at Travessera de Gracia 274, owner Antonina Orlova with NIF B66900374. The service of UnPuzzle Barcelona is giving the individual access (the unique code) to an online service at the unpuzzlebcn.com/game domain as well as online support during the route. UnPuzzle Barcelona has the right to change the routes without changing their quality (the volume of information and number of questions) without prior consent of the users. The start of the quest is considered the activation of the unique code by entering it to the special window at the unpuzzlebcn.com/game page. The unactivated code may be used during 6 months from the date of its purchase. When the quest has started it is available during 10 days from its activation. These conditions may be changed for the quests created for special events and promotions. The un usage of the quest cannot be the reason to demand the return of the money. The customers are responsible for their health and personal belongings during the route all the time. Please be careful! UnPuzzle Barcelona is not responsible for any force-major events or accidents on the route (such as restoration works, closure os some objects due to some events, lack of internet connection) that may bother from completing some of the challenges. However, we will keep the routes updated with the most actual information and nice to walk and play. Your privacy is important to UnPuzzle Bcn, as is your trust in our products and services. We want you to know that the information you share with us will be treated with care. We never use your email for unsolicited emails and never provide them to any third parties without your consent. The information you share with us may be used by unpuzzlebcn.com only. 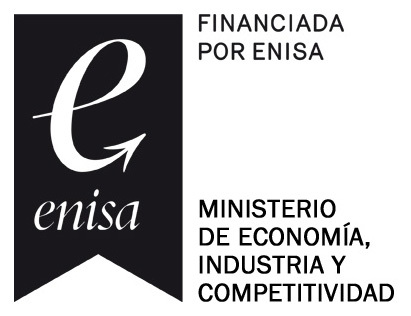 It may also be shared in connection with the sale, transfer or financing of a significant part of a unpuzzlebcn.com business. We will not share your personal information with third parties other than these for their independent use without your permission. If the user shares personal data for the purpose of establishing contact, we will store this data only for as long as it is required for the purpose of communication, customer contact and project planning and implementation. Once the personal data is no longer required by us for these purposes, it will be immediately deleted. Additionally, we collect anonymous technical data, such as the name of your internet service provider, internet browser and operating system, screen resolution and information about the websites that directed you to us, the number and date of your visits, your average time on our site and which of our websites you visited. This data is stored automatically. The evaluation is done anonymously and exclusively for statistical purposes with the goal of continuing to improve our web presence for you. UnPuzzle Bcn will not share your personal data with third parties, unless you have previously given your express permission or unless the transmission is required or permissible by law. We will in particular not sell or otherwise market your data to third parties. Transfers of data to government institutions and authorities is done only within the scope of mandatory national legal requirements. Our employees and partners are obligated by us to maintain secrecy and to comply with legal data protection regulations. UnPuzzle Bcn uses the Google service Google Maps (“Google Maps API”) which provides you with more information. Certain data may be transmitted to Google when it is being used, but this is done anonymously. Based on your declaration of consent, UnPuzzle Bcn processes and uses your personal data when applicable for marketing activities, such as for sending emails with general information or advertising information (newsletters). You can revoke your declarations of consent with us with future effect at any time. Additionally, if we use your personal information as permissible by law, for example for marketing activities by mail, you may object to this use. When you download data, use our mobile applications or access one of our webpages optimized for mobile devices, we may, as described above in this declaration, collect information about you and your mobile device. This may include data about your location. We use this information to provide location-based services such as search results and other personalized content for you, if approved by you and your device. On most mobile devices, you can control or disable location services in the settings menu. If you have questions about how to disable location services on your device, we recommend that you contact your mobile service provider or the manufacturer of your device. If we collect additional personal data which is transmitted as a result of your use of our mobile applications or your accessing our website with a mobile device, we will obtain your express consent in advance. We may collect additional information about you from third parties in order to supplement our account information. This information may be, among other things, demographic and navigation data, credit check information, and information from credit reporting agencies, to the extent legally permissible. Your personal data will be stored for only as long as necessary for the purposes stated in this privacy statement or for as long as we are required by law or legally obligated to store this information. You have the right at any time to receive information free of charge about your personal data stored with us. If your data is stored incorrectly or wrongly by us, we will gladly correct, block or delete it. Please inform us of any changes to your data immediately. Information may be changed or updated without notice. UnPuzzleBcn.com has no obligation to update information presented on this website, so information contained herein may be out of date at any given time. UnPuzzleBcn.com may also make improvements and/or changes in the products and/or programs described in this information at any time without notice.